Dan has extensive experience litigating matters on behalf of individuals and businesses of all sizes in state and federal courts, as well as representing the interests of his clients in voluntary and court-ordered mediation. Dan is a NCDRC Certified Superior Court Mediator. In his family law practice, Dan advises and represents clients in matters relating to separation, divorce, and adoptions, including equitable distribution of property, alimony, and child custody. Dan was selected by his peers in the profession for North Carolina Business Magazine’s “Legal Elite” for 2012 in the family law category. 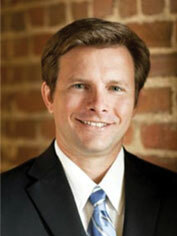 Dan is a member of the Triad Collaborative Family Law Practice Group (www.triadcollaborative.com), which provides an alternative approach to resolving family matters in a private, efficient manner that seeks to minimize the financial and emotional strains associated with separation and divorce. Dan also advises and represents businesses, religious organizations, and individuals in matters involving contracts, employment-related disputes, personal injury/wrongful death claims, insurance coverage disputes, estate disputes and will contests, unfair trade practices claims, among others. Dan holds a B.A. in Political Science from Duke University and a law degree from SMU Dedman School of Law, where he served as Articles Editor for the International Law Review and was published in the ABA’s publication, The International Lawyer. Dan is a member of the Greensboro Bar Association’s Herb Falk Society Planning Committee and has previously served on the Community Involvement Committee and as Family Liaison for the GBA’s Habitat for Humanity Project. Dan is a two-time inductee into the GBA’s Herb Falk Society for his pro bono service. Dan is also a member of the Litigation Section, the Labor & Employment Law Section, and the Family Law Section of the North Carolina Bar Association. In the community, Dan has served on the Steering Committee and Grantmaking Committee (Chair in 2012 and 2013) of the Community Foundation of Greater Greensboro’s Future Fund; serves on the Board of Directors of Seven Homes (a foster care and adoption services agency) and FaithAction International House (helping immigrants meet their basic needs and turning strangers to neighbors); has been a presenter of the Parenting Under Two Roofs program at the Family Life Council; formerly served on the Board of Directors of Holy Trinity Day School and the Board and Executive Committee of the Greensboro Opera Company; and has interviewed candidates for undergraduate admission for the Duke University Alumni Association. Dan enjoys playing USTA league tennis, playing the cello, spending time with his wife (Jennifer) and daughter (Nelessen), and coaching his daughter’s volleyball team.